Today in my New Testament class my professor shared a story. He told of his friend Julie. Many years ago when she was a recent convert, she got a hold of some anti mormon stuff and began to question her testimony. No matter who she talked to she couldnt get an acceptable answer to her doubts. Even her parents couldnt help her. She decided she was going to leave the church. But then something truly amazing happened. You see, Juile was a special ed teacher and one of her students was named Suzie. She was a 13 year old girl with Downs Syndrome. That very same day that Julie decided to leave the church, Suzie attended a very special seminary class. The Lord touched Suzie's heart and helped this little 13 year old girl to realize that she was a daughter of God and that she was a member of the true church. As Suzie came to this realization she wanted so badly to express her feelings of gratitude to someone. Suzie ran from that classroom and went straight to her favorite teacher Julie. As Julie listened to the heartfelt and sincere testimony of a 13year girl with Downs Syndrome, she felt the spirit touch her heart. She felt the love of the Savior reaching out to her through the words and testimony of this little girl. Julie's doubts weren't answered through the powerful words of a bishop, or the help of a home teacher,( although this things most certainly did help). Instead it came through one of God's most simple and humble servants. Someone who was willing to live their entire life as a physically and mentally handicapped missionary. It was from a sweet little girl named Suzie. Now, for my story. 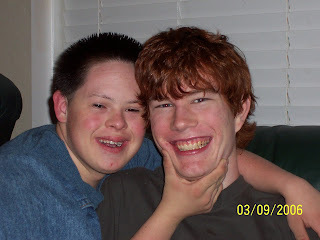 Many of you know that my brother Benjamin was born with Downs syndrome. I speak often of my brother to those who know me. They know how much I love him. But most of all, I love my brother's testimony. Benjamin is an instrument in the Lord's hands whether he knows it or not. He has touched the lives of so many through his loving words and deeds. But to me, he has done so much more than that. In hundreds of different ways over my lifetime, Benjamin has been a testimony builder for me. He is my living proof of the love of God, the plan of salvation, the Christ-like attribute of love and charity, and the living embodiment of perfect faith. It is one of my brothers greatest desires to be a missionary for God's church. I have often seen him studying the scriptures or taking notes from Preach my Gospel. What Ben doesn't realize is that his entire life has been a great mission for God's work. I hope that I can be the kind of person my brother is. It is my prayer and utmost desire to love everyone like he does. I love my family. I love my Father in Heaven. I love the plan of salvation. I love that I have this time on earth to learn and grow and be taught by God's chosen servants. And I love my brother, Benjamin. I owe him so very much. What a great post! Sometimes I forget what a special life Ben lives. Thanks for the reminder. Love ya!